Russian Presidential Commissioner for entrepreneurs’ rights Boris Titov gives an insight he is helping businessmen successfully deal with pressure from officials through the courts. Boris Titov, Russia’s foremost producer of sparkling wines, knows all too well what it’s like to face pressure from officials. But now, as presidential commissioner for entrepreneurs’ rights, he is helping businessmen successfully fight such cases through the courts. 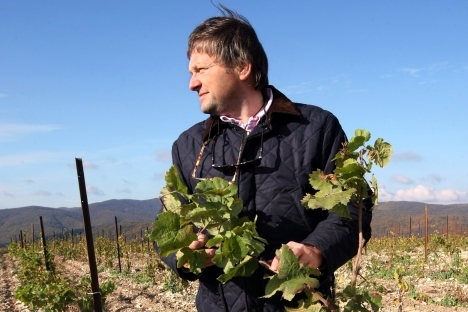 Titov, whose SVL Group produces Abrau-Durso sparkling wines in Krasnodar, on Russia’s Black Sea coast, says he was once the victim of an unjustified “raider attack” by people trying to take his business away from him. Russia's Business Ombudsman "will not lobby for a bribe"
At that time Titov was helped out by his friends. “Not all businessmen have friends that can help, so [for them the commissioner’s office] will be a friend,” he said. The problems Titov is trying to solve – when businessmen face problems created by corrupt officials – are very real, according to a recent survey by Opora, another business association. In 2004, Mr. Titov was elected chairman of Delovaya Rossiya. Two years later, his SVL Group bought a majority stake in Abrau-Durso, a famous Russian-French vineyard commissioned by Tsar Alexander II in 1870, and he invested more than $20 million to modernize production there. Some 13 percent of Russian businessmen admit to paying kickbacks to officials, while 29 percent refuse to even speak about the issue, the survey showed. One-third of respondents complained that it was the police who “created problems” for their business – higher even than the 21 percent who said so about the mafia. Last summer Titov, the head of Delovaya Rossiya, was tapped by President Vladimir Putin to become Russia’s first presidential commissioner for entrepreneurs’ rights. The relevance of the commissioner’s office can’t be overestimated, Titov says. According to Titov’s office, at the end of last year some 13,600 Russian businessmen were serving sentences in jail on economic charges, and about 5,000 were being held in pre-trial detention. The total number of owners of small and medium-size businesses stood at some three million in 2010, according to Russia’s Federal Statistics Service. So far, about 300 businessmen have turned to the commissioner’s office for help, Mr. Titov says. Seven appeals came from non-Russians. “For foreigners, our raiders are still warier of attacking them than Russian companies,” Titov says. His office, consisting of 20 experts who work on a pro bono basis, examines a case to find out if a business has been unfairly persecuted. “We are here to help, but we can help only those who we 100 percent know are right. If we understand we can help, we do our own work on each case to understand what to do, with whom to work,” Titov says. The commissioner’s office has considered more than half the appeals it has received to date. Experts have ruled in favor of businessmen in 30 cases so far, and after the commissioner intervened, seven prosecutions were dropped. It is planned to have local ombudsmen in each of Russia’s 83 regions, with their offices to be funded from regional budgets.